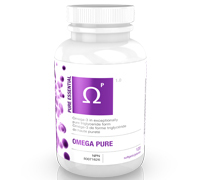 Omega Pure has a high concentration of EPA and DHA which promotes cardiovascular health; reduces inflammation; promotes weight loss; improves concentration and cognitive function; improves the mood and emotional wellbeing; affects the health of the brain, eyes, nervous system and immune system; improves the appearance of the skin and hair, and promotes optimal fat metabolism. Because of their low risk of heavy metal contamination, we use only anchovies and sardines in our Omega Pure. The use of filtration by molecular distillation further reduces the risk of contamination. The stability of the oil is also of major importance. Recommended dose: Adults: take 1 capsule twice a day. Recommended use: Source of omega-3 fatty acids for the maintenance of good health. Source of eicosapentaenoic acid (EPA) and docosahexaenoic acid (DHA) for the maintenance of good health. Helps maintain and support cardiovascular health. Helps to reduce serum triglycerides/triacylglycerols. Helps support cognitive and brain health. An antioxidant for the maintenance of good health.